NewYork-Presbyterian’s Paws for Patients enlists a special fleet of furry friends to boost moods and promote healing. 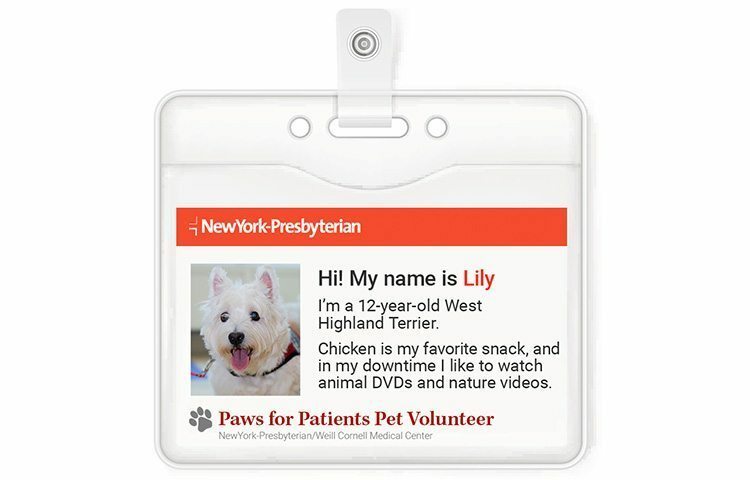 As she walked down the hall of NewYork-Presbyterian/Weill Cornell Medical Center’s pediatric unit, Nina Mortellito, a pet therapy volunteer, and Lily (seen in the slideshow below), her snow-white West Highland terrier, were stopped by a doctor. 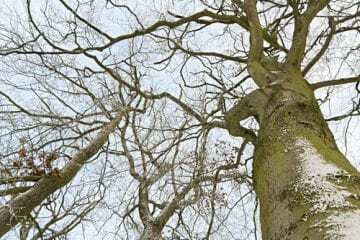 “He said, ‘Wait, wait! Can you come back with Lily?’” Nina recalls. The doctor had been working with a young boy who was reluctant to practice walking. Nina gently approached the child and asked if he would like to meet Lily, then offered him the leash. The boy happily accepted and began to lead Lily down the hall. Nina and the doctor held their breath as they watched him take off. “I stayed a little bit behind them so the boy would feel like he was doing it all by himself,” says Nina. Holding on to Lily’s leash, he walked about 25 feet down the hall. This is the kind of powerful outcome that proponents of pet therapy — the practice of using animals to help patients recover from, cope with, or manage health problems — say can result through contact with a well-trained service animal. After a visit with a dog, youngsters are more apt to engage with their doctors and nurses and express their feelings, she says. 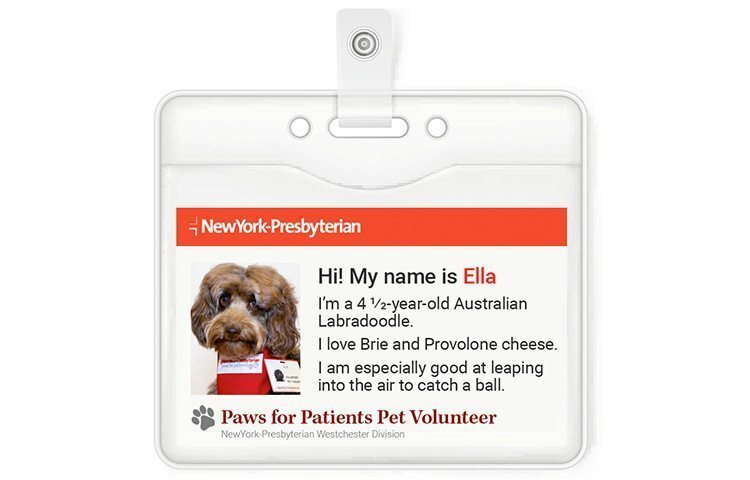 Paws for Patients launched in the mid-2000s, says Evelyn Ramos, corporate director of volunteer and interpreter services at NewYork-Presbyterian. 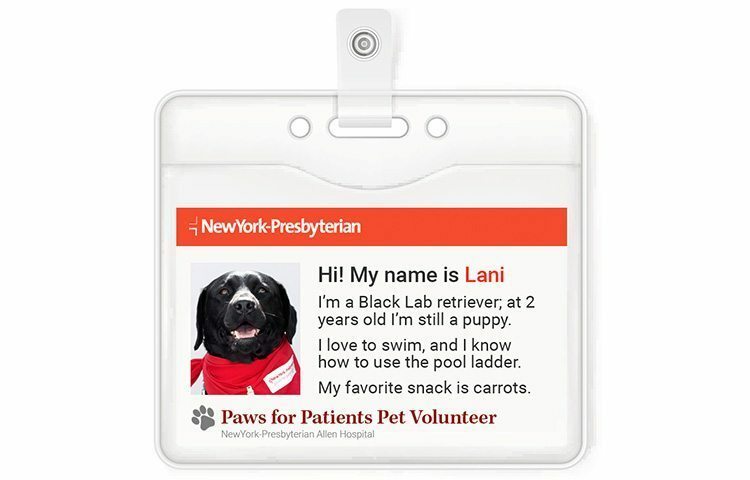 Now made up of 33 teams of dogs and their handlers, the program is available at several campuses, including NewYork-Presbyterian/Weill Cornell Medical Center, NewYork-Presbyterian/Columbia University Irving Medical Center, NewYork-Presbyterian Morgan Stanley Children’s Hospital, NewYork-Presbyterian Allen Hospital, and NewYork-Presbyterian Westchester Division. Qualified dogs are chosen based primarily on their disposition and ability to master commands, then trained to be comfortable around medical equipment such as wheelchairs, IV poles, and walkers. 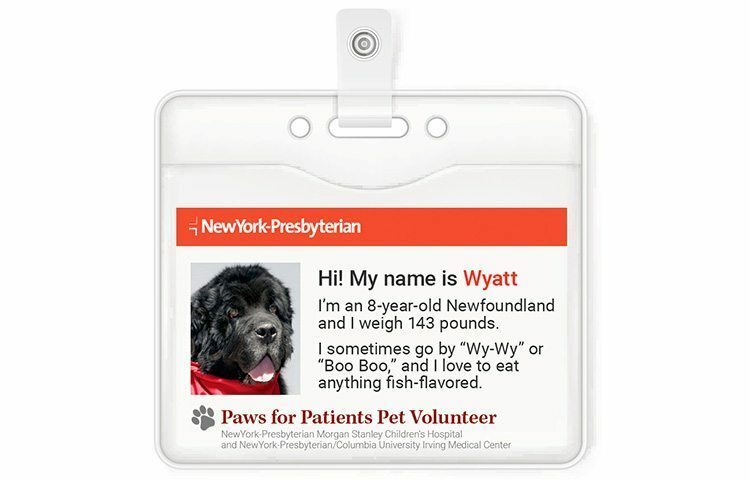 Patients who are deemed medically fit by their care providers may have a dog visit. The dogs and their handlers can visit most areas of the hospital except the burn unit, labor and delivery, operating and procedure rooms, recovery, isolation, and negative pressure rooms. For volunteers like Nina, watching Lily bring a smile to people’s faces makes the effort worth it. 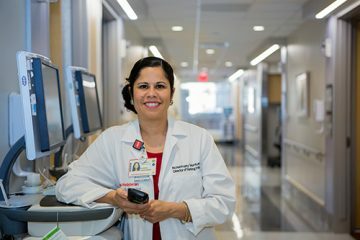 “Watching the patients come alive in a really stressed environment makes all the difference in the world to me,” she says. During a typical stay, Nina and Lily will try to visit a dozen patients, spending about 15 minutes with each. Once Nina arrives at the hospital, she heads to the pediatric unit and is given a list with the room numbers and names. Those who cannot receive a visit or do not want one are highlighted. For everyone else, Nina gently sticks her head in their room and leads Lily inside. In addition to visiting pediatric patients, the duo also volunteers on the antepartum unit, spending time with expectant mothers who are on bed rest. The women are delighted to have company, she says, and they chat about anything and everything to keep their minds off bed rest. Many patients love to have Lily join them in bed for a cuddle and a few doggie kisses, if requested. “It gets the kids giggling and they say it tickles,” says Nina. Patients who may be too sick to get out of bed are happy to have Lily lie down next to them. “A big piece of a visit is that therapeutic touch of petting the dog and having positive responses from both ends,” says Kaiser. “When a dog comes in and a patient gets happy, the dog then gets happy. It wags its tail. 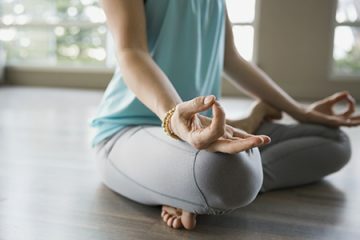 That helps the child feel a sense of control. For volunteers like Nina, that is the most rewarding aspect of volunteering.